I've been pretty busy this week since my husband's been on vacation. Mostly we've been working on stuff around the house. I enjoy feeling that I've accomplished something but a little lazing around is required too. I snuck a little reading time in while sitting around on the deck. This week I finished Madame Tussaud by Michelle Moran and Everything Beautiful Began After by Simon Van Booy. They were both really good, the kind of books that keep your interest when you're lolling in the sun. In the mail this week, the only thing that arrived was an audiobook Summer Rental from Devourer of Books Audiobook Week. Something a little different happened this week. 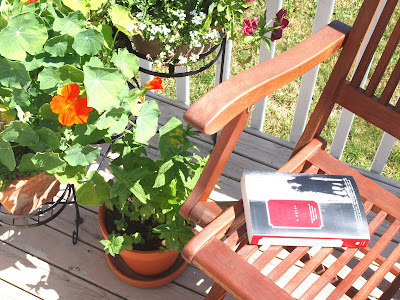 I had my first book review posted for BlogHer Book Club. The book was The Beach Trees by Karen White. Check it out! That's about it. I'm not very interesting this week so here's a photo of a lady with a puppy to make you smile. I love it when my husband's home. For some reason I don't feel as overwhelmed with the chores then. I just got Everything Beautiful Began After yesterday. I haven't read outside once so far this summer... I must remedy that! I haven't read outside at all this summer. I would much rather laze about in my recliner these days. Your porch looks gorgeous though. I can see why you would want to enjoy it!